Learn more about the background of WTC Rotterdam, our architecture, the old Merchants Exchange, our team and more. 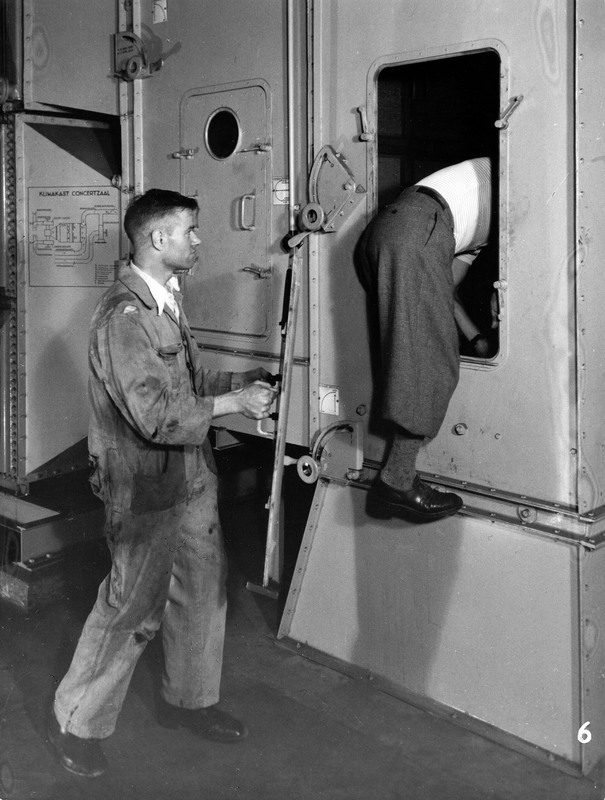 We boast a rich history that we are eager to share with you. WTC Rotterdam dates back quite a few years. To the year 1928 to be exact. We have ambitious plans for the future, but that does not mean that we are not tremendously proud of our roots. The interior of WTC Rotterdam is currently undergoing a complete transformation. The new entrance hall will be sleek and minimalistic, while at the same time offering a warm and inviting welcome with a variety of seating areas and playful use of materials. 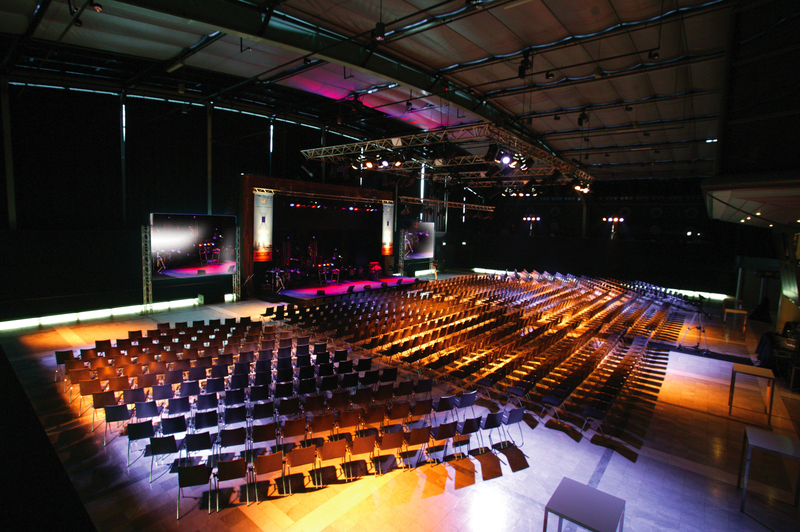 This space is designed to serve as the living room for business Rotterdam. 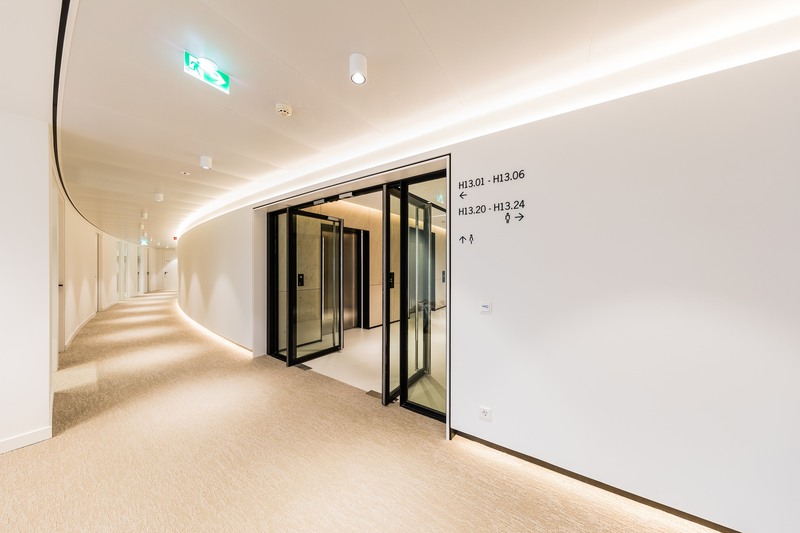 There will be a new receptionist area and the lobby will soon have not only the ‘Staal’ food service establishments, but two new meeting areas: ‘De Koffiesalon’. The Business Center will be expanded and relocated to the entrance hall, making it accessible on the ground floor in the future. We began with the phased renovation of the numerous office areas. We created a more open environment by developing transparent offices, resulting in inspiring spaces that promote and inspire cosmopolitan visions. In 2015, WTC Rotterdam was purchased by Bouwinvest REIM Dutch Office Fund. 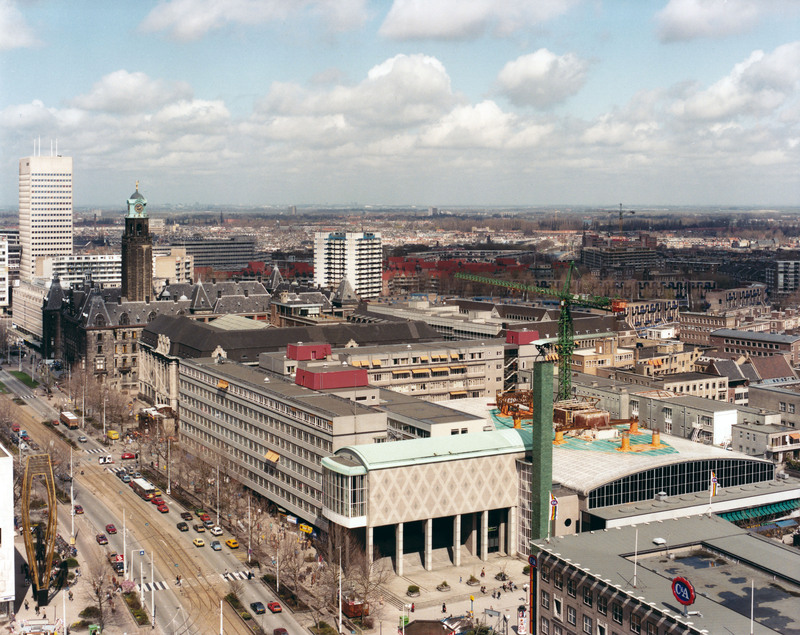 This same year, the name Beurs-WTC was changed to World Trade Center Rotterdam. Since 2007, the Beurs-WTC has had the highest possible rating - 5-hammer classification - granted by the National Conference and Meeting Classification system operated in Belgium and the Netherlands. 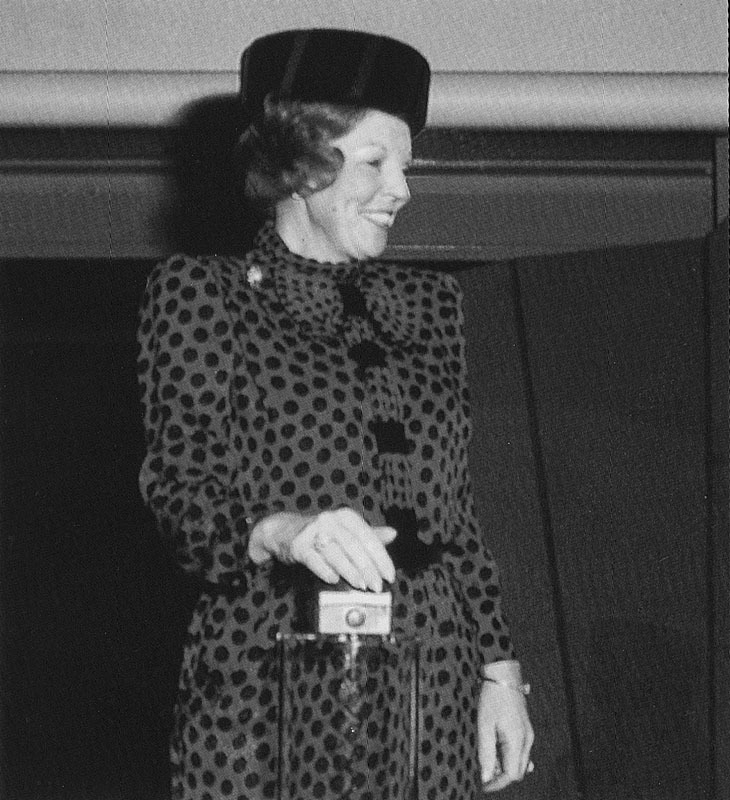 The Beurs-WTC was officially opened by Her Majesty Queen Beatrix on 25 November 1987. The construction of the high-rise began on 13 February 1984, when the first pile of the Beurs-WTC was driven into the ground. 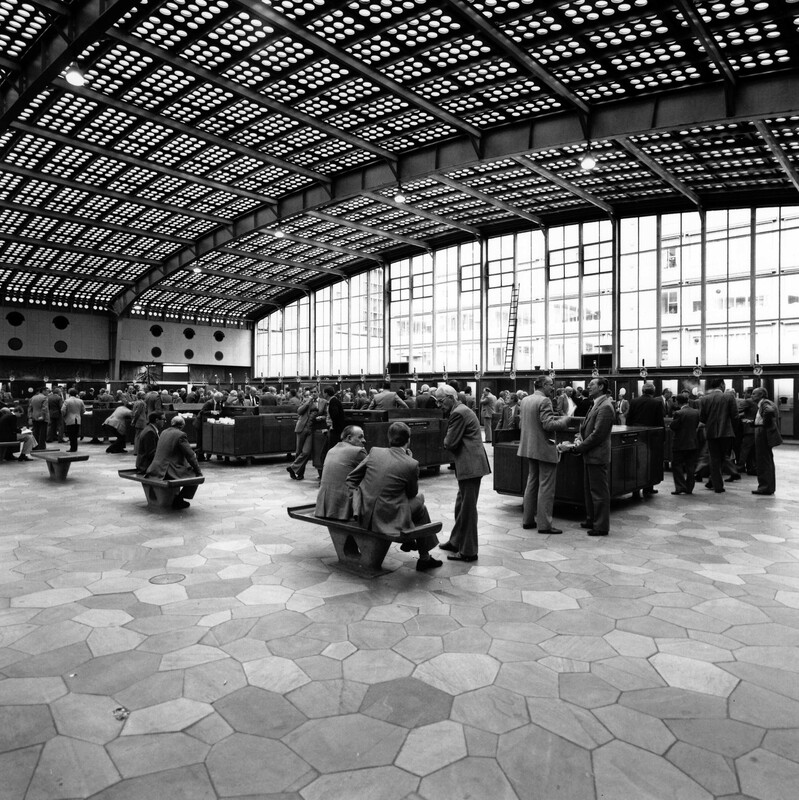 Incidentally, currency trading still took place in in the Beurs-WTC at this time. Various representatives of major banks converged here daily in the 1980s, where they determined currency rates. On 19 April 1968, WTC Rotterdam received the official WTC license from the World Trade Center Association (WTCA). 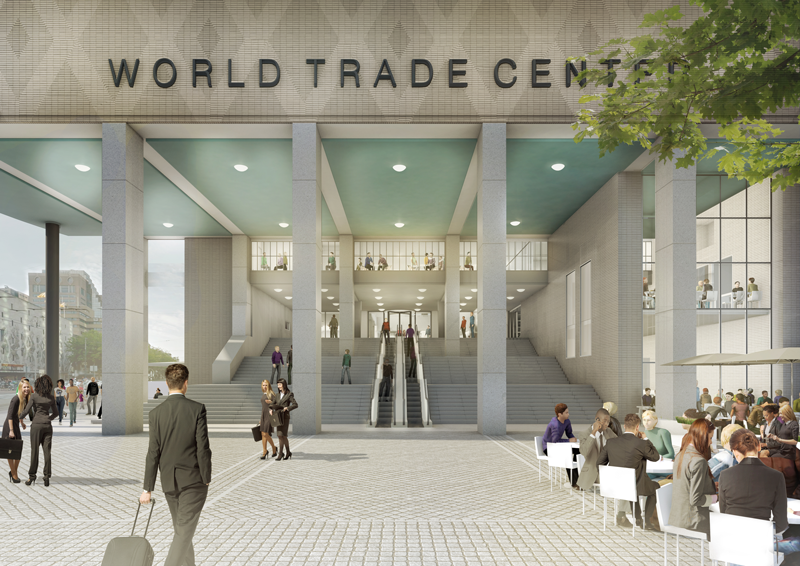 Since then, WTC Rotterdam has been one of the founding members of the WTCA. The labyrinth beneath the Exchange was used during the war as the perfect hiding place for around 75 people. When in danger, they could crawl and hide among the numerous passageways and pipes. The first tenants moved into the Exchange building in 1940. 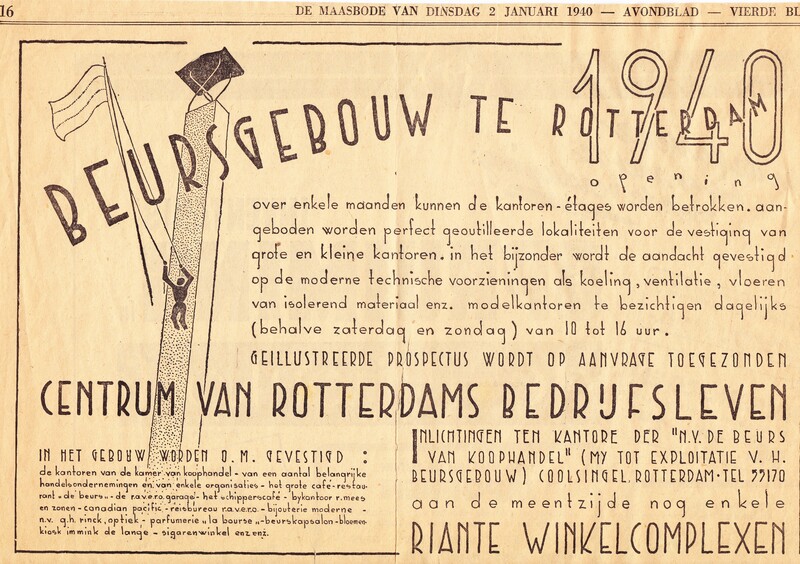 At that time, the rental price for an office on the Coolsingel side was more than a thousand guilders a year. The price on the Meent side was several hundred guilders cheaper. Rotterdam was bombed in May of this year and the Exchange was not left unscathed. 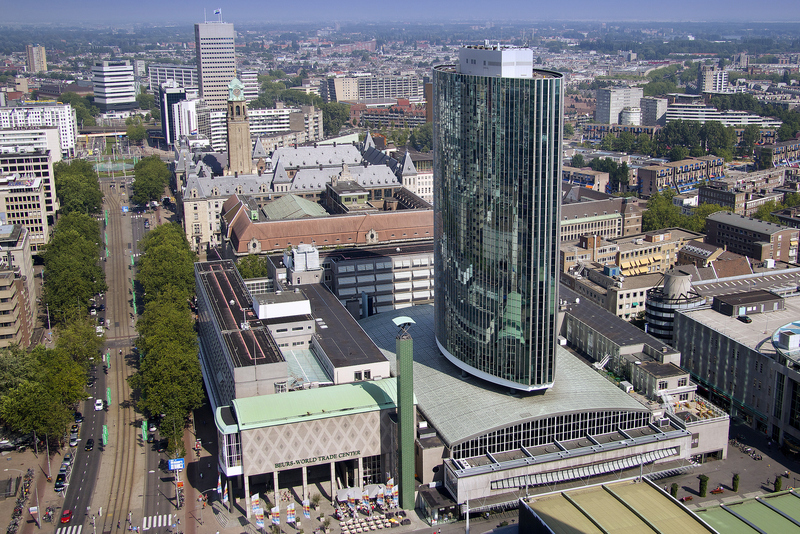 No fewer than seven bombs were dropped on the building but, thanks to its durable concrete construction, the Exchange was one of the few buildings in Rotterdam to survive the bombings. 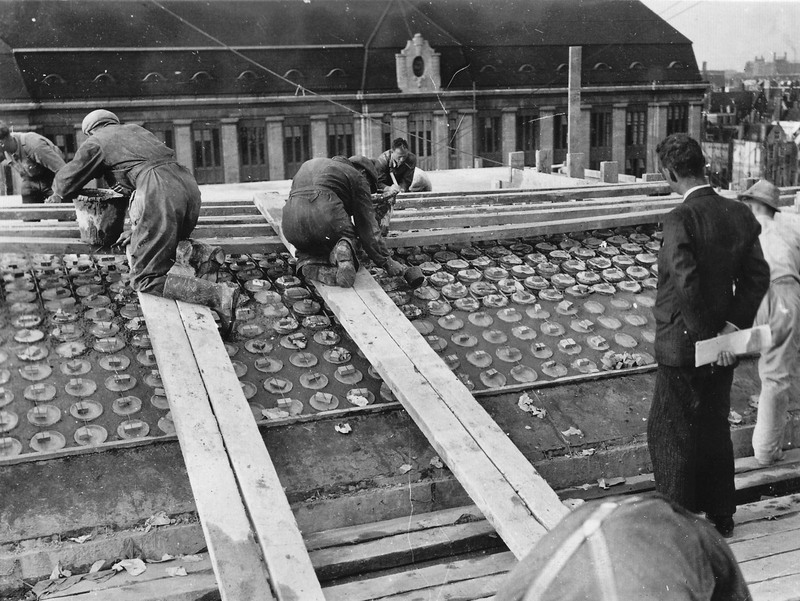 Construction on the Exchange building began in 1936. At this time, most of the work was done by hand. Why? It was one of the most complicated projects of its time. Part of the city center even needed to be demolished to make way for the building. A contest was held in 1928 for the design of the new Exchange building. The competition caused quite a commotion. Architect J.F. 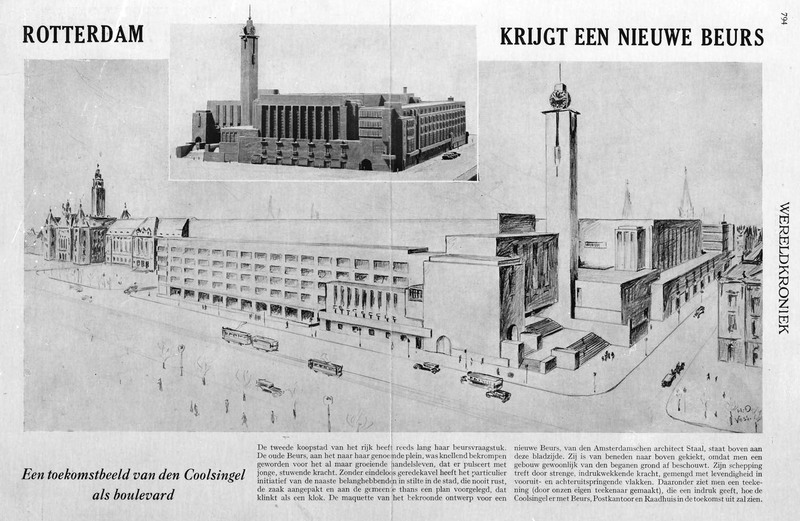 Staal ultimately won the contest and built the Rotterdam Exchange in the ‘Nieuwe Bouwen’ style. What made his design so unique was the entrance. He succeeded in creating an historic and monumental look & feel that was not typical of this architectural style.